I was pleasantly surprised by this novel. I guess I always sort of thought it was about young girls, not women (as much of it is), and when I realized that these “girls” were not, in fact, little girls, I was glad. Not that I don’t enjoy stories that are about children, but I found this very interesting. I have to admit that one of the most interesting things about this novel is the format. Alvarez not only tells the story in reverse, but she puts the time periods in sections (1989-1972, 1970-1960, and 1960-1956) and proceeds through them all in reverse-chronological order. Unlike Fae Myenne Ng’s novel Bone, Alvarez’ story seems to be going in reverse as a means by which to trace the girls’ development back to the time during which they still had accents (or the time during which they didn’t have accents because they lived in the Dominican Republic and spoke Spanish like everybody else). By beginning with their adult selves living the States with families and friends, having overcome many major obstacles in their lives, Alvarez starts the reader with a look at how the girls will all turn out; this way, as we read backwards into their pasts, we can see the events that shaped them into the women we already know they will become. 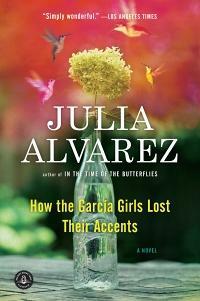 In Ng’s novel, the backwards chronology seems to work as a lens through which to focus the reader’s attention on a major trauma at the center of the characters’ lives (Ona’s suicide), but in Alvarez’ novel the backwards chronology serves the purpose of filling us in on the complicated events of four women’s histories so we can understand their complexities. The three sections the novel is broken up into (each one consisting of 5 different parts) visits a significant period in the girls’ lives. Part I is their adult lives, Part II is their teenage/college lives, and Part III is their childhood lives. Each part is haunted in its own way by their family’s flight from the Dominican Republic — I by the distant past that still casts its shadow over their lives, II by the not-so-distant past that continues to feel like a tangible threat to their happiness and safety, and III by the soon-to-occur future that looms ahead of all of them just waiting to force their displacement from home/family/friends when they flee the DR for NY. In a similar way, each part is haunted by who the girls were in previous parts. I contains echoes of the women’s childhoods; issues and events that developed earlier in their lives are shown to continue playing significant roles in their happiness. II contains echoes from the past and the future, as the reader realizes what some of the events in this section will lead to while continuing to feel traces of the girls’ pasts that are coming out in their adolescent lives. And of course, III takes place at the earliest point in their lives, but (just as the black mama cat continues to haunt Yoyo well into her adult life) key events take place here that the reader understands will lead to certain nuances in the García girls’ adult personalities and lives. The way each part speaks to the other parts is really interesting, and was one of my favorite things about this novel.